As luck would have it, at Stanford I found myself teaching in the same department with Tina Seelig. Tina is Professor of the Practice at Stanford University School of Engineering, and Executive Director of the Stanford Technology Ventures Program. Reading her book inGenius: A Crash Course on Creativity was the first time I realized someone had cracked the code on how to turn imagination and creativity into innovation. Here’s Tina’s latest thinking on the foundational skills necessary to build a new venture. There is an insatiable demand for innovation and entrepreneurship. These skills are required to help individuals and ventures thrive in a competitive and dynamic marketplace. However, many people don’t know where to start. There isn’t a well-charted course from inspiration to implementation. Other fields — such as physics, biology, math, and music — have a huge advantage when it comes to teaching those topics. They have clearly defined terms and a taxonomy of relationships that provide a structured approach for mastering these skills. That’s exactly what we need in entrepreneurship. Without it, there’s dogged belief that these skills can’t be taught or learned. Below is a proposal for definitions and relationships for the process of bringing ideas to life, which I call the Inventure Cycle. This model provides a scaffolding of skills, beginning with imagination, leading to a collective increase in entrepreneurial activity. This is a virtuous cycle: Entrepreneurs manifest their ideas by inspiring others’ imagination, including those who join the effort, fund the venture, and purchase the products. This model is relevant to startups and established firms, as well as innovators of all types where the realization of a new idea — whether a product, service, or work of art — results in a collective increase in imagination, creativity, and entrepreneurship. This framework allows us to parse the pathway, describing the actions and attitudes required at each step along the way. Not every person in an entrepreneurial venture needs to have every skill in the cycle. However, every venture needs to cover every base. Without imaginers who engage and envision, there aren’t compelling opportunities to address. Without creators who are motivated to experiment, routine problems don’t get solved. Without innovators who focus on challenging assumptions, there are no fresh ideas. And, without entrepreneurs who persistently inspire others, innovations sit on the shelf. As a Biodesign Innovation Fellow at Stanford University, Kate Rosenbluth spent months in the hospital shadowing neurologists and neurosurgeons in order to understand the biggest unmet needs of physicians and their patients. In the imagination stage, Kate worked with a team of engineers and physicians to make lists of hundreds of problems that needed solving, from outpatient issues to surgical challenges. By being immersed in the hospital with a watchful eye, she was able to see opportunities for improvement that had been overlooked. This stage required engagement and envisioning. In the creativity stage, the team was struck by how many people struggle with debilitating hand tremors that keep them from holding a coffee cup or buttoning a shirt. They learned that as many as six million people in the United States are stricken with Parkinson’s disease, and other conditions that cause tremors. The most effective treatment is deep brain stimulation, an onerous and expensive intervention that requires permanently implanting wires in the brain and a battery pack in the chest wall. Alternatively, patients can take drugs that often have disabling side effects. The team was driven to help these patients and began meeting with experts, combing the literature, and testing alternative treatments. This stage required motivation and experimentation. In the innovation stage, Kate had an insight that changed the way that she thought about treating tremors. She challenged the assumption that the treatment had to focus on the root cause in the brain and instead focused on the peripheral nervous system in the hand, where the symptoms occur. She partnered with Stanford professor Scott Delp to develop and test a relatively inexpensive, noninvasive, and effective treatment. This stage required focus and reframing. In the entrepreneurship stage, Kate recently launched a company, Cala Health, to develop and deliver new treatments for tremors. There will be innumerable challenges along the way to bringing the products to market, including hiring a team, getting FDA approval, raising subsequent rounds of funding, and manufacturing and marketing the device. These tasks require persistence inspiring others. While developing the first product, Kate has had additional insights, which have stimulated new ideas for treating other diseases with a similar approach, coming full circle to imagination! The Inventure Cycle is the foundation of frameworks for innovation and entrepreneurship, such as design thinking and the lean startup methodology. Both of these focus on defining problems, generating solutions, building prototypes, and iterating on the ideas based on feedback. The Inventure Cycle describes foundational skills that are mandatory for those methods to work. Just as we must master arithmetic before we dive into algebra or calculus, it behooves us to develop an entrepreneurial mindset and methodology before we design products and launch ventures. By understanding the Inventure Cycle and honing the necessary skills, we identify more opportunities, challenge more assumptions, generate unique solutions, and bring more ideas to fruition. With clear definitions and a taxonomy that illustrates their relationships, the Inventure Cycle defines the pathway from inspiration to implementation. This framework captures the skills, attitudes, and actions that are necessary to foster innovation and to bring breakthrough ideas to the world. This framework allows us to parse the skills, attitudes, and actions needed at each step in the entrepreneurial process. I was thinking about how much this would have been helpful and today you post it! You are great Mr. Steve Blank!!!!!!!!!!!!!! I believe I have the kind of thinking tools you seem to be looking for. You decide. They are based on what I call an engineering approach. 2. use this to trigger search for solutions, and quantify the effects of the solutions. and in my emerging book ms. I also teach Startup Planning Courses, as of 2014 so far only in Norway and UK, where I reside. Using these methods. I’d be very interested to know if you think there are equal or better methods for managing product creativity? If so let me know. I have not seen them. I’ve experienced this myself, and seen other extremely smart and talented people not doing a startup simply because they didn’t know where to start. Having been starting businesses (or trying to) since I was a teenager, constantly looking for new businesses ideas through my current adult life, and coming up with lots of bad ideas, I start looking for patterns in what the product/idea component of the most successful startups and large companies all have in common. And how it differed from the startup ideas I’ve seen fail. I noticed some patterns. Four to be exact. 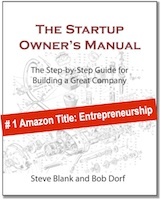 So I wrote a book about it called “Where Startup Ideas Come From: A Playbook For Generating Business Ideas.” It includes four methodologies to generate new business ideas, based on analyzing the success of dozens of successful companies. 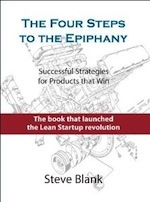 Steve, you’ve modified the product development process from (1) have an idea, (2) build a product, and (3) see if it has market demand to (1) have an idea, (2) getting in front of customers to see if it has market demand, and (3) building a product iteratively to meet demand. In this book I propose to start with the end in mind (build something people want) and generate an idea based on what market demand data you have or can get quickly and the four patterns I’ve identified. The four methodologies are intended to focus on generating ideas that meet real needs, not just creative ideas. 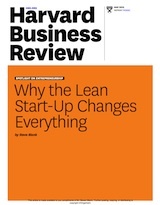 They’re intended to make the Lean process go even smoother because the starting point keeps the end goal in mind. You can check it out on Amazon here: http://www.amazon.com//dp/B00MNR7646/. I would love to get your thoughts. I give my books away, you are selling them in comments. Give us free links to evaluate your thoughts. All we know now is that you are self serving. Great to hear that Tina’s work is coming into focus Steve. Having heard from Prof Luke Pittaway on the US models and how they compare… this is the guidance on quality enterprise and entrepreneurship for ALL UK Universities, and dare I say that a conversation with Tina back in 2010 helped to cement these understandings. Ideas led by enterprise and entrepreneurship are founded on the ability to think and act creatively. • think speculatively, employing both convergent and divergent approaches to arrive at appropriate solutions. The divergent and convergent models of thinking seem to have gained most traction here, and the new understanding about intellectual property are also gaining strength… because when you get innovative you have to be in position to decide what you want to invest in and what you are happy to give away. Excellent stuff Steve. I’ll be curating it for my blog collective. Very educated by it. Love reading your articles Steve. There’s a golden nugget in each post and something new to explore. The 4 step framework makes so much sense. I guess that’s why it’s so important to have co-founders that compliment each other skills as an individual will not necessarily be good at each of those 4 steps. The ‘Inventure Cycle’ is palliative. It is full of platitudes and academic hubris. It’s fine if producing these chestnuts is your day-job. Thing is, ideation doesn’t follow it and entrepreneurs can’t use it. These lofty, TED-style bromides are certainly entertaining. However, they’re useless in the real world. Robust ideation is chaotic and complex and does not fit into neat little methods, no matter how good the rhetoric or how accomplished the author. Sorry. But the world is filled with pop methods that the gullible swallow. So I just laid out my alternatives for free for SB and others to consider and ignore. I thin SB is a good guy, but the short letter and slogans rightly caused a reaction. I suspect there is more below the headlines. The so-called ‘insatiable demand’ also creates a warped priority to somehow deconstruct entrepreneurship into an order system like BPM so that the ‘process’ can be reproduced, measured and scaled with ease. That’s a fool’s errand. Thing is, ideation is a complex activity. That’s where Inventure falls down. Western-Cartesian thinking prefers, for no good or proven reason, a clinical preoccupation with the futile notion of standards, process, measurement. This Western adherence to analytic reductionism and measurement of complex activities the among the leading causes of entrepreneurial challenges. Your TEDx talk was excellent. Too often people get flummoxed trying to describe complex systems. Yet, at the same time, they do it everyday with ease and accuracy. Hunh? Yep. Take three massively complex phenomena: weather, markets, and the circulatory system. We use quantitative measures to comprehend them all. Weather? Temp & barometric pressure. Markets? Indexes and prices. Circulation? Pulse and blood pressure. It’s simple AND complex! These systems use factor analysis and cardinal numbers to describe massively complex systems that no one could ever possibly comprehend fully. Even love… it is simply the level of the neuromodulator oxytocin in the brain! It is not my intention to be harsh, but ideation and entrepreneurship is not about soapy aphorisms. Rather, stunning entrepreneurial thinking involves network multiformity, conceptual blending, abduction, situated cognition, disequilibrium, serendipity, narrative, lateral thinking, exaptation and a wide-range of other crucial nondeterministic behaviors and activities. Steve – this is good stuff. You’re accomplished – and would not expect anything less. A few comments – and they are not raw originals. Remember – when the Entrepreneurs’ label was: Ready, fire, aim. Has a familiar ring to it, however the game and this continued, tough-as-nails, Market Economy does not foster that mindset. Do like idea generation – and leverage anything and anybody that can contribute – different perspectives make a good soup. An area that seems to distinguish entrepreneurs from others – is the Risk Profile and endurance of taking success and failing in stride. Pulling up the boot straps and going forward – no matter what. Will end with this example – have a close, long-term, connection with a brilliant scientist/technologist. Has run his company for decades and has a game-changing approach for alternative energy sources. The only issue is that he has a competing idea every minute and is unable to apply constraint and focus. He chases ideas – and needs outside influence to come back to realize that he is running a business, not fueling a Think Tank. He also accepts this condition – and has no hang-up turning to those that can bring implementation/execution to the party.It takes a variety of styles, discipline & expertise – to make it happen. Keep up the great work – it is useful. Being an entrepreneur requires one to be Creative by applying imagination to address challenges, Innovative by applying creativity to come up with unique ideas, and finally inspiring people by using innovation. It is no secret however that some of us are not born with such skills… But I do believe that a skill needs to be practiced in order to be mastered. On that note, I must agree with Steve Blank on the fact that like any other career field, entrepreneurship should have principles to be followed to guarantee success in businesses that people embark on. 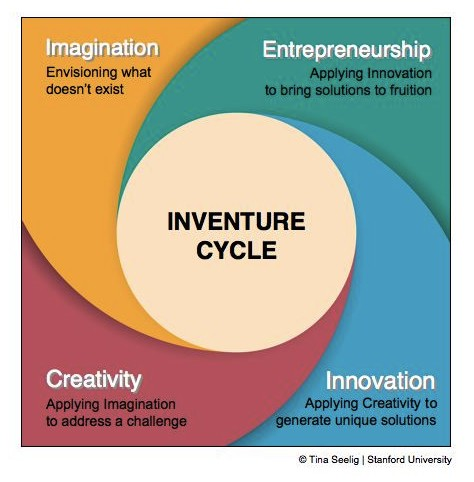 The Inventure Cycle is indeed the foundation of frameworks for innovation and entrepreneurship. Steve – do prescribe to the Inventure Cycle – like your perspectives. On the flip-side – also see the Risk Profile of the Entrepreneur – distinct from many people in the crowd. Ask an Entrepreneur – what their sense is for the risk they are taking – putting it all on the line – for their belief and conviction – and they shrug their shoulders – and say, what risk? – I’m betting on myself (at the early stages of the business). Ask an employee the same question – and they speak boldly about how predictable success is – and the reward that they expect to receive for their efforts – however they will not take the shot – and put everything on-the-line. There is no right or wrong, although there is a difference in mindset (and maybe, even DNA), between the two. Both are necessary to fuel & develop an effective organization. One other question – there is a difference, between imagination, creativity and innovation, however on the business priority queue – where does this sit in American Industry? I think that the Inventure Cycle can be a useful framework to reference throughout the process of creating an innovative product or service. The four bullet points listed are incredibly broad and for this reason I think the cycle can adapt to the chaotic environment that is entrepreneurship. The example given is interesting from an idea development perspective, but I think that mapping the steps taken by the student group at Stanford back to the Inventure Cycle is kind of a reach. The group does an excellent job of designing a product based on a current need, minimizing the risk that you will develop a product that no one will pay for. However when a component of the cycle is mapped to work performed by the group I think that the cycle is devalued. Rather than stages in a process, this cycle seems more useful as tools to be iterated through during the process of creating a product or service. I quite agree with some of his ideas and theories. In his article, he proposed an inventure cycle. This cycle is composed of four parts of the imagination, creativity, innovation and entrepreneurship. When people have these four virtual things, then we make a framework for our practical work. And in this process we can also resolve our skills attitudes, and actions that have been taken in every step of the entrepreneurial process. If people can have the imagination, creative and innovation these three virtual thing, and do some corresponding requirements and attitudes, eventually you will be able to dream come true to achieve entrepreneurship that is realization. So the business need market, the market will need to be creative, if there is a creative as a foundation, coupled with the necessary attitude and hard-working, then we can eventually lead and change the business. Can we think of entrepreneurship as a science? I had this thought thinking about how other fields had benefits when it comes to startups. We can look at the Google’s definition of science and detect if there’s a relation. We can relate entrepreneurship to science through what we study, based on observation and experiment of the physical and natural “business” world.